Sorry about the blogage shortage. I have been preoccupied lately with the selection process of a new principal for our school next year. As part of the interview team, it has been pretty intense. We are down to two candidates and we should know next week. Today was the first annual Dolphin Dash at Sidney Glen. The PTA sponsored a 5k run/race with a carnival afterwards. I had decided that it has been about 15 years since I took a race seriously, and I was curious what this 50 year old could do in a 5k. There were about 200 participants and I thought there might be some competition. I started strong off the starting line and took the lead. I could hear someone behind me and assumed I was leading a pack. After about a mile, a teenage boy passed me. I decided to look back. There was nothing else there! 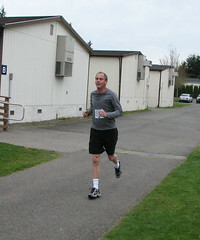 I tried to keep up a strong pace for the rest of the race and finished 2nd, well ahead of any other competitors. My time was a little over 22:00. Then it was into a cold dunk tank at the carnival. By the time I got dried off, I was in the initial stages of hypothermia.